I have been knitting since I was eight years old. Though I do several other types of crafts, knitting is my first love. When I discovered beads I found a new outlet for my needles. All of these items were created using the beaded knitting method of adding beads. Black Rose (This includes a watch and matching earrings.) 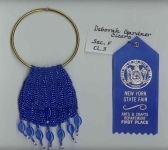 Only the necklace was entered into the Great New York State Fair. Another Jabot I knitted for Terre. Another Jabot using Lori Bell’s pattern. I knitted this using 36-gauge wire. This was an experiment with using wire for knitting. It is not one of my favorite methods. I named this original pattern Little Wonder and hope you will enjoy it with no conditions attached! Pretty in Pink is 3¼" x 3½" at the base. Another one I made for no particular reason. I made a lot of these and gave them to family and friends. I cannot remember if this is a pattern I came up with or something I found on the Internet. it is about 1-1/2" x 1-7/8". My first bead knitted pattern, I made Arizona Sunset for my friend, Gail, who lives in Arizona. The beads used as embellishment came from an old necklace I purchased at a flea market in Old Forge. I liked Arizona Sunset so well, I tried to duplicate it. The seed beads a bit different and I used fire-polished beads purchased from Fire Mountain Gems for the embellishment. Another Jabot beaded purse: All in Blue. Little Lady Liberty was entered in the 2004 Great New York State Fair and won 4th prize. In 2003 this bead knitted purse won first place! It is called Blue Thistle is the pattern is from The Complete Guide to Beading Techniques by Jane Davis and can also be found in Big Book of Beautiful Beads by KP Books. I made this on a whim three weeks before the entry deadline of the 2004 Great New York State Fair. A winner! Thanks to S. Debra Santaniello for the free pattern. In 2002 this bead knitted purse won first place! This small red and black bead knitted purse was my first entry in the Great New York State Fair. It won third prize! Terre's Surprise was entered in the 2006 Great New York State Fair. It was awarded fourth place and was intended as a gift for my sister, Terre! One of my favorite patterns for this little purses, it was offered for free at With My Needle. The site is not longer available at GeoCities. Here is the pattern for personal use only. I have properly credit Lori Bell, the designer and hope she does not mind that I am sharing the pattern. Here is the same “jabot” pattern. I reversed the cotton and bead colors. You can find this little “window pane” amulet bag pattern in Knitting for the first time, by Vanessa-Ann, ISBN 0-8069-6415-4. This is the first “window pane” bag I made. This is a good example of why it is best to use contrasting beads. Yet another “window pane” amulet bag example.